Thornton H. (Jock) McCay was a four-year letterman in baseball and earned three letters in basketball at Fredericksburg High School between 1923 and 1927, but his biggest contribution to area athletics has been since that time. A pillar in the Wayne County League sports scene since the 30s, McCay has always had a helpful hand in the WCL. 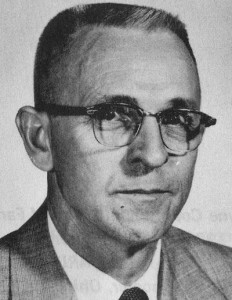 After graduation from Muskingum College in 1932, McCay was Junior High coach at Fredericksburg until 1935. He moved on to Magadore High School as principal and assistant coach. In 1939 he returned to Fredericksburg to stay. For 13 years, McCay was the only coach at the high school. His baseball teams compiled a record of 133 wins and 107 losses. In basketball, his record was 177-140. He also started the track program and his five-man team came in second in the league. In 1948, McCay was elected Secretary of the Wayne County League and has held that position ever since. This job involves scheduling all nine sports in all of the WCL schools. For the first 10 years, it also required him to schedule officials for all the contests. And in those days there were 13 schools around the county. McCay served as Chairman of the County Athletic Committee for 11 years and often served as manager of the county basketball tournament. Jock has been honored twice for his winning of over 100 games, once in basketball, and again in baseball. In 1979, the Ohio High School Athletic Association awarded him a citation recognizing 31 years of sports administration. McCay has also coached several independent ball teams.